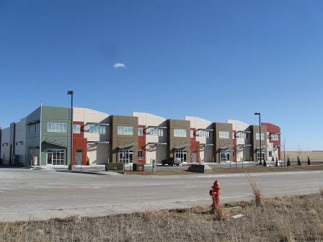 (Lonetree, Colorado) - May 25, 2009 - Generation II Warehouse was recently awarded the Award of Excellence for theTilt-Up (Cast in Place) work at Generation II Warehouse in Greeley, Colorado that NCB, LLC completed. This award was given by the American Concrete Institute (ACI) for NCB's quality Tilt-Up concrete workmanship. NCB, LLC performed all site and building concrete at this project. ACI is a nonprofit technical and educational society organized in 1904 and is one of the world's leading authorities on concrete technology. As its chartered objective states, its purpose is "to provide a comradeship in finding the best ways to do concrete work of all kinds and in spreading that knowledge." "We are honored to receive this award from ACI and are very excited that our Tilt-Up expertise and hard work is getting recognized. We hope to continue to receive such quality awards on future projects," Todd Nordstrom, Managing Member, NCB, LLC. Located in Lonetree, Colorado, Nordstrom Commercial Builders (NCB, LLC) provides construction services encompassing integrity, quality and value. NCB specializes in the construction of office, retail, warehouse, industrial and self-storage facilities from design to completion of the project.